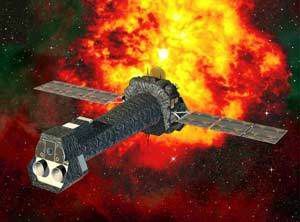 The XMM-Newton satellite was launched from Kourou by an Ariane 5 rocket on 10 December 1999. It has a greater X-ray source detection capacity than all its predecessors allowing it to contribute to solving many puzzles involving the most spectacular phenomena in the universe, from the formation of galaxies to black holes. It started sending images in 2000 and should continue until at least 2018. Cutting edge technologies were used in its design which includes over 170 very thin cylindrical mirrors arranged in three telescopes. Its elliptical orbit (115,000 km at the apogee and 6000 km at the perigee) takes it to a distance equivalent to a third of the Earth-Moon distance, allowing astronomers to make long uninterrupted observations of the celestial objects they are studying.